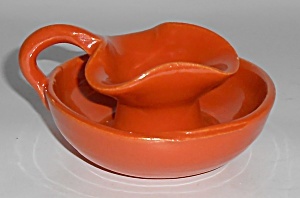 This is an offering for an early Bauer Pottery Matt Carlton orange candlestick holder measuring 3-1/2" wide at the rim. There is a pinhead size glaze flake on the inner rim and and pinpoint glaze flea bite on the rim. No other nicks, chips, cracks or repairs. Shipping for this fine addition to your collection or mission arts and crafts decor is $9.95.